A definitive explanation for why plants evolved spines remains elusive, and human biases compound the problem. A tobacco hornworm caterpillar (Manduca sexta) slowly makes its way through the spiky thorns of Solanum atropurpureum, the plant commonly known as purple devil. Why do roses have thorns? The answer seems self-evident: Thorns, spines and prickles are plants’ defensive weaponry, making their most precious parts unpalatable — even untouchable — to big plant-eaters, like deer and other mammals. For decades, this has been the working assumption of scientists who study ecological interactions between plants and animals. The overwhelming bulk of the scientific literature on the ecological and evolutionary purpose of thorniness (or, to use biologists’ preferred terminology, spinescence) has focused on the hypothesis that mammalian herbivores are the main target. That may have been a mistake. Over the years, studies of how well sharp deterrents discourage hungry mammals have returned mixed results. Moreover, some paleontological work offers evidence that spines evolved before the first plant-eating terrestrial animals did. Now, a report in Biology Letters suggests that, at least for some plant species, spines play an important role in defending against insects — a hypothesis that has long been ignored if not dismissed entirely. The counterintuitive results show the pitfalls of trusting human experience and intuition too much when trying to understand the evolutionary dynamics of other species in a prehistoric world. 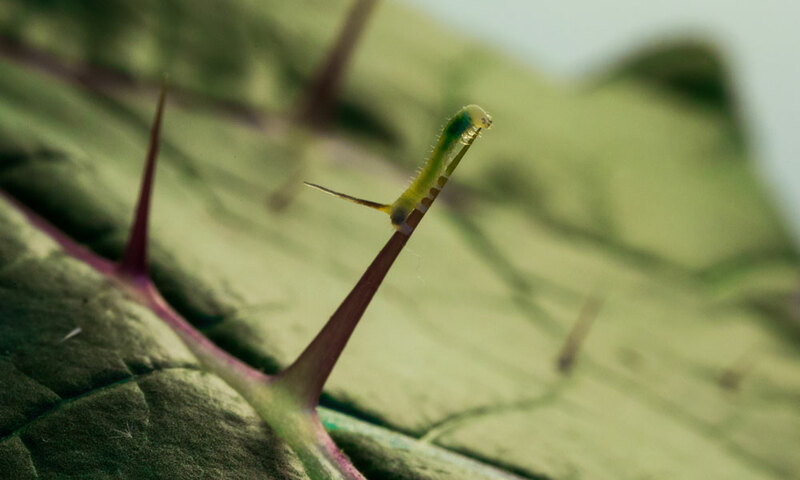 Rupesh Kariyat, an ecologist studying plant-insect interactions in the biocommunication group at the Swiss Federal Institute of Technology Zurich (ETH Zurich), didn’t set out to upend the conventional wisdom about plant spines. As a doctoral student at Pennsylvania State University, he was working with Mark Mescher (also now at ETH Zurich) on the genetic consequences of inbreeding and herbivory on Carolina horsenettle plants (Solanum carolinense) when the pair noticed something strange. After tobacco hornworm caterpillars (Manduca sexta) fed on the plants, new shoots sported more spines. “That made us think that these spines could also have [an] additional function than what we have been taught,” Kariyat said. Researchers had documented other plant species that grew extra thorns in response to predation by mammals. But seeing caterpillars have the same effect raised a flag for Kariyat and Mescher. From an ecological perspective, it’s wasteful for a plant to expend energy growing a structure like a thorn unless it thwarts the attacker at hand. Surely the tiny caterpillars could simply climb around or over the horsenettle’s spines. A tiny tobacco hornworm caterpillar ascends a leaf spine of Solanum atropurpureum. Defensive spines might seem too big to be impediments to the insects, but tests suggest otherwise. To test whether that was so, Mescher explained, the team designed a set of experiments that could explore the question three ways. First, using the same inbred S. carolinense variety — which has fewer spines than genetically normal plants do — they examined the effects of spine density on caterpillar movement. After removing all of a plant’s leaves save the freshest, tastiest one at the top, they placed caterpillars on the soil next to the plants’ stems and clocked how long it took the bugs to reach the tasty morsel above, comparing inbred plants to normal ones. Then they went a step further by manipulating the spine density, slicing away spines with a razor blade so that all the plants had the same number, and repeated the experiment. Lastly, they expanded the research to include two other species in the same genus: S. aethiopicum, the Ethiopian nightshade, and S. atropurpureum, the purple devil. The three species vary in spine density: Ethiopian nightshade has the fewest, while the purple devil has the most. 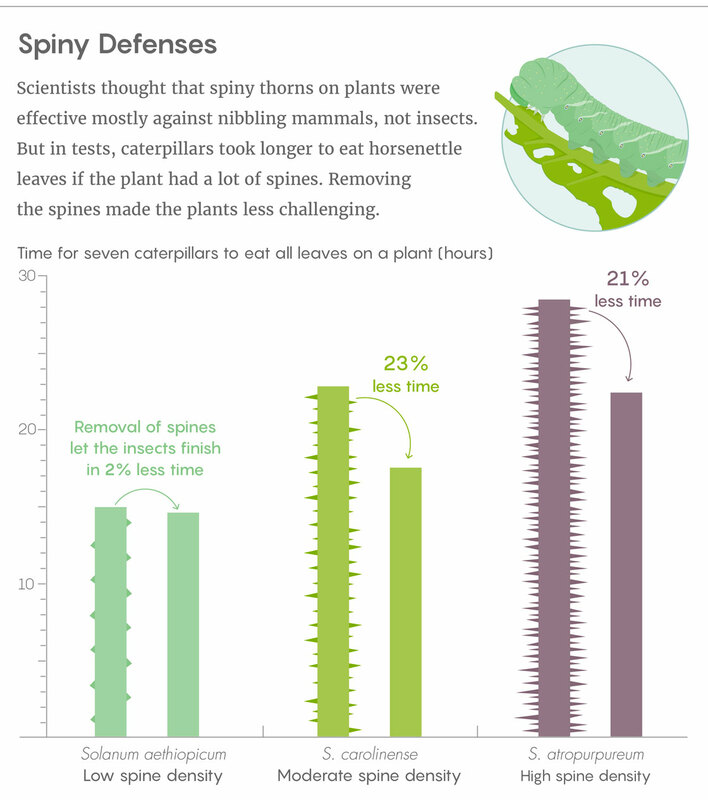 Again they compared plants with their spines intact and removed, but this time they measured how long it took caterpillars to remove all of a plant’s leaves rather than speed to the leaves at the top. 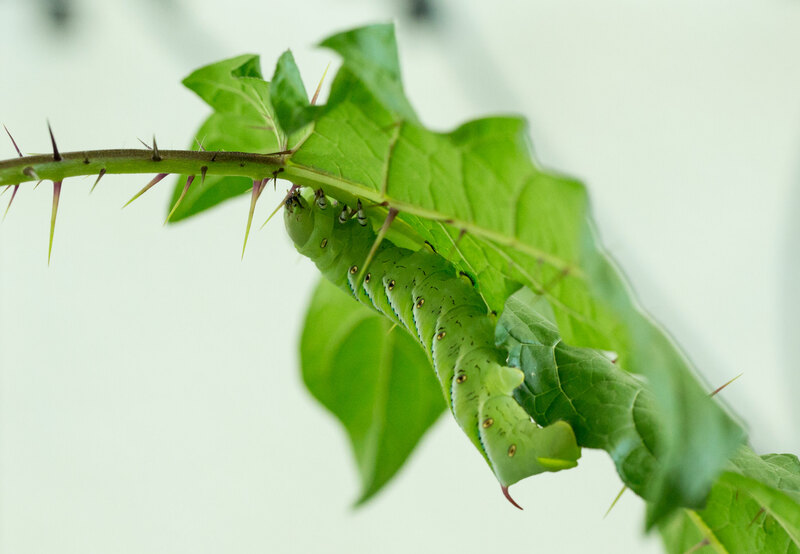 If caterpillars fell off the plants during the process, the researchers put them back on an unfinished leaf and allowed them to continue feeding. Kariyat, Mescher and their colleagues found the same pattern across all three trials: Spines were always an impediment to the hungry larvae. With the prickles cut, caterpillars more quickly reached the leaves they desired. For intact plants, the species with the most spines — the purple devil — proved most difficult for the caterpillars to defoliate. Moreover, the spines not only slowed the caterpillars but also interfered with their footing and forced them into more acrobatic maneuvers. As a result, the caterpillars frequently fell off while traveling between leafy shoots. Sometimes they even impaled themselves on the larger spines. 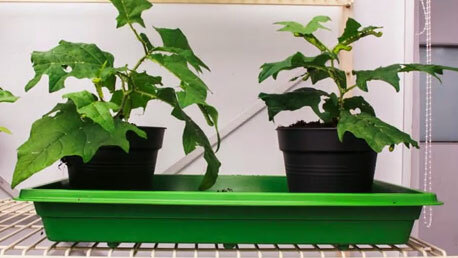 According to Kariyat, these kinds of movement restrictions “have a huge effect on their fitness in the long term” — and thus, the authors concluded that the spines of Solanum plants are effective caterpillar deterrents. Nevertheless, the team does not insist that their results prove insects were the primary reason that plants developed spines, prickles and thorns. To the contrary, Kariyat said, “We think that spines evolved against mammalian herbivores.” But they suspect that at some point in history, the horsenettles and other plants found an even more effective weapon — toxic alkaloids in their tissues — and mammals stopped eating them regularly. The caterpillars, which were largely unaffected by the alkaloids, became specialists at preying on the plants. Evolution may then have co-opted the plants’ spines for a new defensive purpose, a phenomenon known as exaptation. “So over time, these spines have started to have an additional benefit, helping the plant win the arms race” against the insects, he said. The unexpected results were a bit hard for others in the field to swallow. “When I first read this paper, my overwhelming response was: ‘Oh, that’s just [nonsense] — there are so many problems!’” said Angela Moles, a research professor at the University of New South Wales in Australia, who studies the ecological strategies of plants. 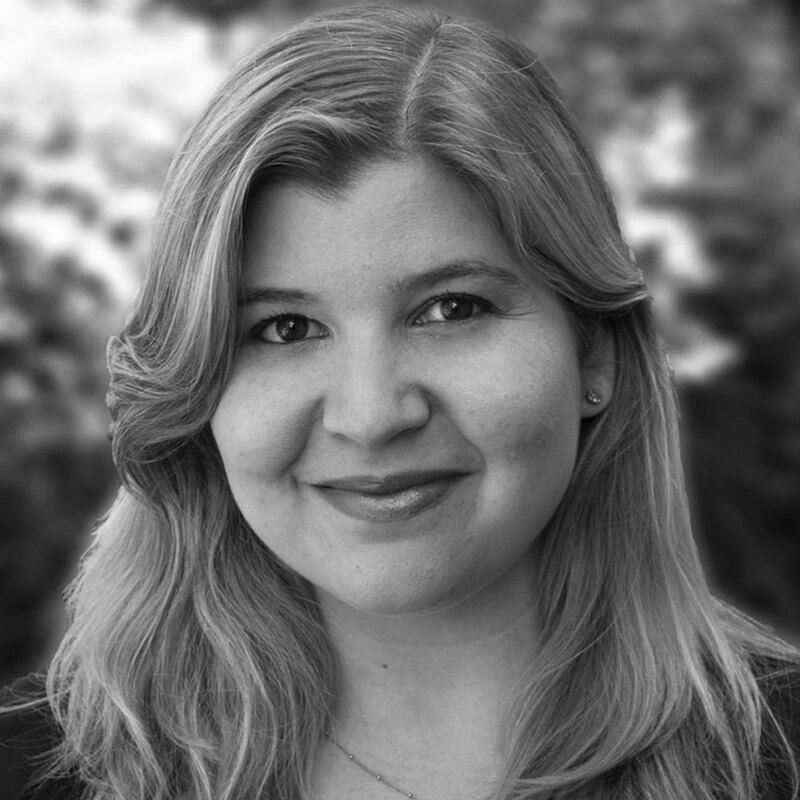 “Then the more I read it, the more I was, like, ‘Actually, it’s right.’” Her sentiments were echoed by Mick Hanley, an associate professor at Plymouth University in the United Kingdom, who was lead author on a 2007 review paper about plants’ structural defenses. “I looked at it at first and I thought, hmm. Then I read it again, and I saw that it all sort of hangs together,” he said. Others are less convinced. “I’m not sure that we can conclude from their results that spinescence is an adaptation against insect herbivory,” said Tristan Charles-Dominique, a plant-evolution specialist at the Xishuangbanna Tropical Botanical Garden in China. He and William Bond, emeritus professor at the University of Cape Town in South Africa, used phylogenetic methods to show in 2016 that the diversity of spiny plants in Africa coincided with an uptick in bovid mammals, such as wildebeests and gazelles. That finding supports the traditional view that spines defend against large mammals. This time-lapse video observes tobacco hornworm caterpillars feeding on two S. carolinense plants. The plant on the left is intact; the plant on the right has had its spines cut off. The leaves of the left-hand plant survive longer because the spines restrict the movement of the caterpillars. Perhaps that is because a highly influential and widely cited study examining the possible role of plant spines in insect herbivory was published in 1988; the authors found that removing the spines from holly leaves had no effect on caterpillar feeding. (An irony is that the same study also questioned the value of those spines in deterring mammalian herbivores, because in feeding trials the animals failed to show a preference for spineless leaves.) In the 29 years since that publication, the scientific literature seems to have applied those conclusions — that spines don’t function as insect deterrents —to all forms of spinescence on all species of plants.